Photo courtesy of Phil Cigan. Strange place to go for a bit of the other. The ‘yourself’ dustbin is behind you. @Classic Steve: At least they’re too polite to write “barbarians” on the bin. .. but, drop trash on the floor and you’ll get yours! So that’s what happened to that TV show I used to watch! 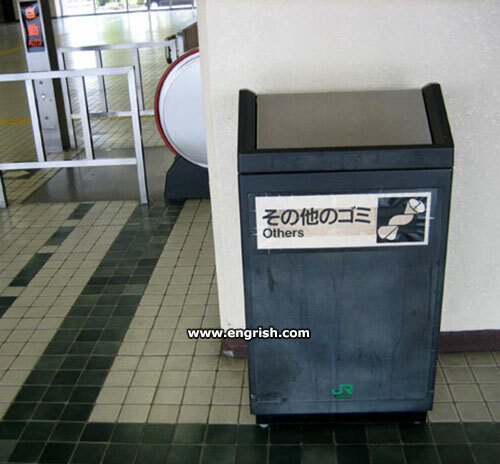 Only other people can this rubbish bin. Warning: Naked Singularity. Either you or the universe will go insane if you look at it! Ah, the peculiarities of the Japanese trash disposal & collection system. Very different from most other countries. Can be quite confusing!